A patio should be a versatile space. Use your enclosed patio for entertaining family and friends, use it for a place to have breakfast, or just relax and read a book. With custom enclosure ideas, you can even screen in your swimming pool or hot tub. There will be no burning sun beating down on you, and no bugs to bite you within your enclosure. Homeowners need to make good investments when it comes to home improvements. The addition of an enclosed patio not only gives you extra living space, but also increases the value of your home. Your custom enclosure will not be a cookie-cutter type of room. A unique design will be fabricated to your specifications. The materials used will be chosen through a collaboration between you and an expert installer. If you’re building your enclosed room over an existing patio or foundation, this will minimize the amount of construction and meet your needs and budget. This customized approach will give you a room to be proud of, and a space to enjoy your lifestyle. It will be a space that you will frequently use, again and again. 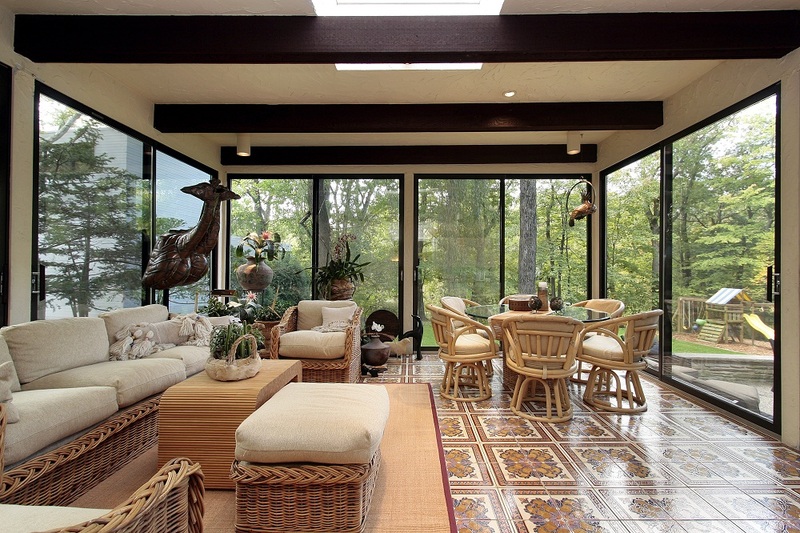 A four-season patio should be able to withstand both hot and cold weather. The most important considerations are the insulation and type of glass used. By using insulated glass for the windows, ultraviolet rays from the sun will be blocked, preventing fading of your furniture. You can also expect the room to stay cooler, use less energy, and help keep your electric bill lower. Use your patio spring, summer, fall, and winter. Enjoy nature without actually being outdoors. There is research confirming that direct contact with nature increases mental and psychological health. In the winter, lack of sunlight can cause seasonal affective disorder in some people. You won’t need to concern yourself with lack of sunlight in your four-season patio. You will always have plenty of light when you spend time in your enclosed patio. It can be air-conditioned to enjoy it in the summer, and if you live in a cooler area, it can be heated in the winter. Dress up your new room with the comfy furniture that you were afraid to leave outdoors on your open patio. You can even have a TV and other conveniences installed in your four-season patio.